← A tool to convert print files (PXL and PCL) to PDF, PS, JPEG, BMP, TIFF, etc. Wanna convert technical AutoCAD DWG to PDF in A3/A4 page size? This tutorial will show you how to convert DWG to A3/A4 page size PDF by using VeryPDF AutoCAD to PDF Converter. 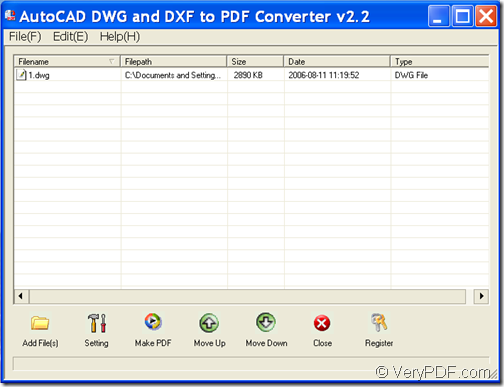 DWG a universal CAD (Computer Aided Design) data file format developed by Autodesk to enable data exchange between AutoCAD (a CAD software application for 2D and 3D design and drafting) and other applications. DWG files can be large in size and not everyone has the ability to read CAD DWG files. 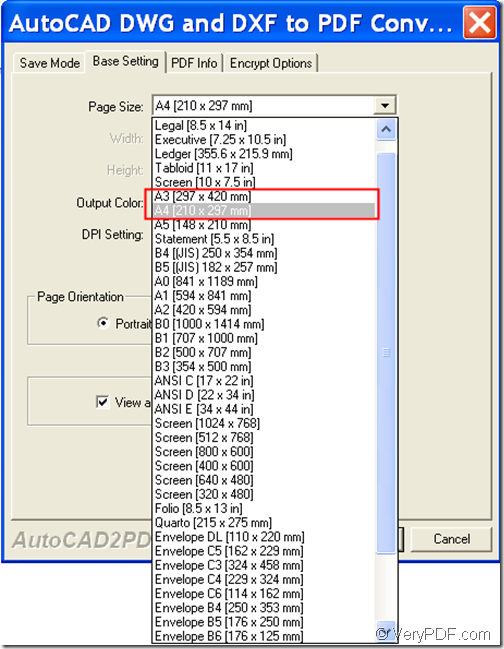 What’s more, making a PDF from AutoCAD may lose the paper size and drawing scale. In this case, converting DWG to PDF is a practical way to share your CAD drawings with other people. PDF Information: You can add PDF description (title, subject, author and keywords) to the converted PDF. PDF Security: If your CAD drawing contains sensitive or private information, you can encrypt the output PDF with user and/or master passwords. In addition, it supports to set encryption level and printing, changing, copying, etc. permissions for the created PDF. Only recipients knowing the password can view its content. PDF Page Size: You can set PDF page size as A3, A4, A5, B4, etc. You can also customize the page size for the created PDF. PDF Color: You can set the output color as black and white, grey, or 256 colors. 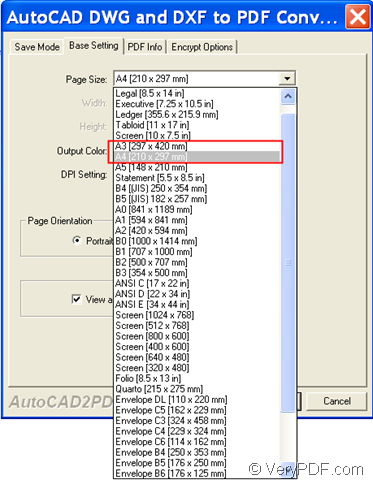 PDF DPI Resolution: You can set the DPI as default, 0, 72, 100, 150, 200, 300, 600, or 1200. PDF Page Orientation: You can set the page orientation as portrait or landscape. Merge multiple DWG/DXF files into a single PDF: You can combine a lot of DWG/DXF files into a single PDF for better organization. 1. Download and install VeryPDF AutoCAD to PDF Converter. 2. Open the software, click the Add File(s) button at bottom of the software interface, and then select the DWG file you want to convert to PDF and click Open. The following snapshot is from the main interface of this software. 3. Click the Setting button at bottom of the software interface and click the Base Setting tab in the popup window. 4. Select A3 [297x420 mm] or A4 [210x297 mm] in the dropdown box of “Page Size:” within the “Base Setting” panel. Please see it in the next snapshot. 5. After choosing the page size, click OK button apply the settings. 6. Click the Make PDF button at bottom of the software interface and choose a location to save the PDF file. The following snapshot shows the conversion effect. Note: The trial version will red watermarks on the converted PDF. To remove the watermarks, please buy the full version of VeryPDF AutoCAD to PDF Converter.